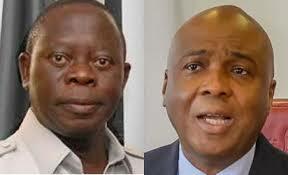 Senate President Bukola Saraki has called on the National Chairman of the All Progressives Congress (APC), Adams Oshiomhole, to resign from politics. The Senate President was reacting to reports that Oshiomhole collected bribes during the conduct of the ruling parties primaries. Speaking to newsmen on Tuesday on the sidelines of the sixth remembrance prayer for his late father, Dr. Olusola Saraki, the Senate President said there is no moral justification for him to continue to remain in politics. He said that the former Edo State governor has no locus standi to talk about morality in today’s Nigeria’s politics. Saraki said: “Oshiomole is somebody, who we have been told had been collecting not even Naira but dollars from candidates and he is being accused by his party’s aspirants and Governors. Also speaking on the upcoming bye-election in Irepodun /Ekiti /Oke Ero /Isin federal constituency, the Senate President condemned the huge deployment of policemen and sudden change of divisional heads of police for the by-election. He said: “When the Inspector General of Police(IG) begins to do things like this without following due process, it is not good for our country. And that is what we always stand for. “And all those who are supposed to caution him should ensure that due process is followed in things like this. “We have been doing bye-election here, I have never seen where the Divisional Police Officers( DPOs), are being transferred. We have been doing bye-elections here, I have never seen where 200 or 300 security personnel are being deployed.